Minister Louis Farrakhan (2nd Right) passionately discusses issues effecting Black people with The Breakfast Club (L-R) DJ Envy, Charlamagne Tha God and Angela Yee in New York. NEW YORK (FinalCall.com) - The “World’s Most Dangerous Morning Show” may have lived up to its name with a powerful appearance by Nation of Islam Minister Louis Farrakhan on “The Breakfast Club,” a popular syndicated hip hop program. The 82-year-old leader was energetic, spirited and passionate in his words to Breakfast Club hosts Charlemagne Tha God, DJ Envy and Angela Yee. “Every generation that we have produced has confronted White racism. It doesn’t get better,” said Min. Farrakhan in the full roughly 90-minute interview. 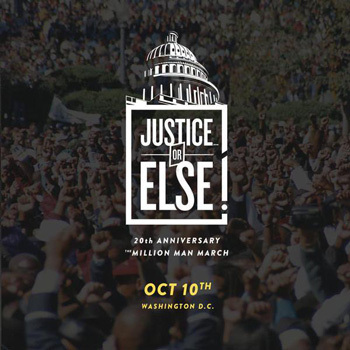 The Minister’s main topic was “Justice Or Else!” the theme of the upcoming 20th anniversary gathering of the Million Man March scheduled for Oct. 10 in the Nation’s Capitol. There was no generation gap here as the man who counted Malcolm X as a mentor and bows to the Honorable Elijah Muhammad as his teacher spoke words that had Twitter—and young people—on fire. 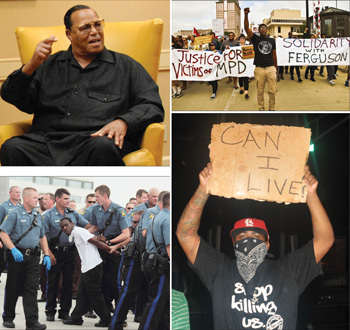 “Farrakhan” trended for hours as a hot topic and social media sites were lit up June 5. The Minister stressed the need for Black America to make a serious decision about its response to and its future as police killings and assaults, racial oppression, mass incarceration and disrespect for Black life seems to know no limit inside America. “Damn it, if we can’t get justice, if we can’t have peace; if our children are dying in the streets, and there is no redress for our grievances, why the hell should we stay here and continue to live like this?” he asked. “And then join an army, and go somewhere and fight for the same damn enemy that’s doing what he’s doing to us? We’ve got to make a serious decision and there’s not much time left to play with life, and to play with the future of our children. “And all these weak leaders, that are apologists for tyranny: They have to get out of the way,” said Min. Farrakhan. He applauded Floyd “Money” Mayweather for breaking from boxing promoter Bob Arum to earn $30 million in a single fight by forming his own company. He advised the boxer to carefully watch those who come to help with investment and other advice and to be aware of the conniving that exists in the hearts of those who hate Black independence and Black success. He urged Black athletes and entertainers to reject the status of highly paid slaves poked, prodded, pinched, bought and sold on modern auction blocks. The sports owners and their associates will make you rich, but will never show you how to pool your resources to have real power and real impact on the lives of your people, he said. Riches don’t buy you out of oppression of disrespect, the Minister said. He spoke candidly about President Barack Obama’s out-of-bounds condemnation of Black youth who exploded because of outrageous suffering and police brutality in Baltimore. “We helped our brother get in office; and we were so excited and proud to have our first Black president. And then when our brothers in Baltimore—I mean, that’s a city where Black folk have been catching hell for a long time. When they rise up, our president refers to them as ‘thugs’ and ‘criminals?’ I want to say to Brother Barack: You know, when the highest office in the land can look at our children and call them “thugs” and “criminals”… unwittingly, he’s sentencing them to death by the forces that deal with thugs and criminals. “They are not thugs! They are not criminals! They are angry young people,” said Min. Farrakhan. “The Breakfast Club” airs on New York’s Power 105.1 radio and discusses hip hop, celebrity news, current events and trending topics. Through syndication the show is one of the most popular for young people across the country. It also has a popular YouTube presence and the hosts have Twitter followers that range from one million to over half a million followers. It was this audience that Min. Farrakhan was determined to reach in the face of growing threats to Black youth and Black life—threats that come from without and within. Fratricidal violence must stop and this is a war to be fought on two fronts, the Minister stressed. But his message was incredibly passionate, including a few instances of raw language, as he recited history lessons about struggles, warned of ongoing plots to Black existence and explained the power and success that comes with unity and courage. This is not a time for cowardice, he said. “ ‘Singing in,’ ‘wading in,’ ‘crying in,’ ‘praying in’ has not worked; marches have not worked. And the oppression and the tyranny is getting worse,” said the Minister. Thirty minutes of the interview was broadcast over Power 105.1 on June 5 before the entire interview was posted online. The interview was taped June 4. With the anniversary gathering of the Million Man March, the theme isn’t “Atonement, Reconciliation, Responsibility” but a serious demand for justice, the Minister said. “When you say you’re going for ‘justice’ and ‘jobs,’ that’s no time to party! That’s a time to be serious, because (of) the cry for justice against the forces who uphold injustice. Now you’ve got to have a mind: ‘What are you going to do to move the forces of injustice if they won’t bow to the truth that should bring justice?” he said. “And at that point, we’re in ‘The Valley of Decision. We’ve been living in ‘The Valley of The Shadow of Death’—but we’ve been doing the dying. So we’ve got some serious decisions to make as a people! And I intend to put that before the Congress, before the government, before the Department of Justice, [and] the president. But more importantly, to put it before us as a people: What are we going to do to prepare a future for our children and our grandchildren?” he asked. “Our young people represent the strongest and the best generation that we ever had. They’re not the wisest, but they are the best because they are fearless. And when you see fearless young men and women, that’s the generation that God’s hand is on because that’s the generation that will fulfill the promise of the ancestors who died struggling for true freedom, justice and liberation; but the young are the generation that will deliver on that promise—with the right leadership,” the Minister continued. His way would never put youth in a foolish and dangerous position, but God Himself is with Blacks in America and we must show a willingness to fight and die if necessary, said Min. Farrakhan. There is an assault on Black life through law enforcement, through the courts, through attacks on voting rights, through joblessness and flooding poor neighborhoods with drugs and guns and even through vaccines and the scourge of AIDS, he warned in a strident voice. These conditions are “social engineering” designed to destroy Blacks from within and without and bear witness to biblical scripture of “principalities and power and spiritual wickedness in high places,” the Minister said. Presidential administrations have looked at decreasing world population as a matter of American security interest, and that plot today targets Blacks, said Min. Farrakhan. The Bible speaks of pharaoh dealing wisely with the growing population of the children of Israel by plotting against them—and that scripture is being fulfilled today, he said. We cannot pass on a legacy of cowardice to our children and will not collect Black votes to simply give votes to Hillary Clinton or any politician, he added. We will hold our votes to make demands and extract justice, which means we have to put power behind those demands to force our oppressors to give us what we deserve, the Minister said. Read Dr. Martin Luther King’s speeches during his last year of life and you hear a man who woke to the America nightmare, said Min. Farrakhan. He wasn’t assassinated because he had a dream, the Minister added. The interview helped bring the Minister to a new generation, with a media blackout and ban on colleges campuses against him. “Eighty-two years young, looks better than all of us,” said host Charlemagne Tha God, at the beginning of the interview. On Twitter he said to his 1.1 million followers, that the Minister would be on his show, and the show sparked follow up stories from hip hop outlets and media outlets, including the Source, BET.com, and Hip Hop Wired. “They done pushed Farrakhan to cursing S--t just got real on the @breakfastclubam @djenvy @cthagod @angelayee,” tweeted Hell Rell ‏@sxynymamii on June 5. “@LouisFarrakhan just changed my way of thinking to help lead this generation,” tweeted WORDPLAYTJAY ‏@wordplaytjay on June 5.
http://www.worldstarhiphop.com/videos,” tweeted Jesse Muhammad, who handles social media for Min. Farrakhan, under the Twitter handle @brotherjesse on June 7. “I think this was a watershed moment in American history. I think it was truly, truly, truly a bold and courageous thing for them to do to bring in the Minister who really is the leader for the times that we are living in right now,” said Dr. Boyce Watkins of YourBlackWorld.com, FinancialJunteenth.com and strong advocate for Black self-reliance and economic cooperation to build power. “The thing about Farrakhan that’s really interesting to me is that he is very, very different from the other leaders that we’ve seen over the last 40 years,” said Dr. Watkins in a YouTube video. “The reason I am very excited about Farrakhan being on The Breakfast Club is because The Breakfast Club has done an amazing job of capturing the ear of urban America,” he observed. Part of the Minister’s appeal is “real recognizes real,” and young people need real leadership to harness their power and gifts, Dr. Watkins said. Min. Farrakhan has been independent of President Obama, dignified, respectful but critical when necessary and outspoken on urban issues and problems, he added. Conversations with Min Farrakhan were talks with a free Black man who offered words about what it takes to be free not begging, compromising or hoping for the best, said Dr. Watkins. When it comes to education, economic power, and protection, we have to do that for ourselves, no matter how many corporate jobs we get, he said.